PNC Financial Services Group, Inc. (stylized as PNC) is an American financial services corporation, with assets (as of December 31, 2015) of approximately $358 billion, as well as deposits of approximately $249 billion. PNC operations include a regional banking franchise operating primarily in nineteen states and the District of Columbia with more than 2,600 branches, online and mobile services together with 9000 ATMs, specialized financial businesses serving companies and government entities, and asset management and processing businesses. In the U.S., PNC is the fifth largest bank by number of branch offices, sixth largest by deposits, ninth largest by total assets, and third largest by number of off-premises ATMs. PNC is based in Pittsburgh. 1970s-era Pittsburgh National Bank logo, used until the 1982 merger to form PNC Bank. PNC's offices in Troy, Michigan. PNC Financial Services traces its history to the Pittsburgh Trust and Savings Company which was founded in Pittsburgh, Pennsylvania on April 10, 1845. Due to the long recovery from the Great Fire of Pittsburgh, PNC was not fully operational until January 28, 1852, when it opened offices at Liberty Avenue and 12th street. The bank was renamed The Pittsburgh Trust Company in 1853. 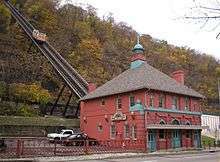 In 1858, the company located its corporate offices at the corner of Fifth Avenue and Wood Street in Pittsburgh where they remain to this day. The bank changed its name to First National Bank of Pittsburgh in 1863, after it became the first bank in the country to apply for a national charter as part of that year's National Banking Act. It received charter number forty-eight on August 5, 1863, with other later banks receiving charters sooner due to paperwork problems and the fact that the bank was already in business. By 1959, after a series of mergers, the bank had evolved into the Pittsburgh National Bank, which later became the leading subsidiary of Pittsburgh National Corporation. Another branch of the current bank, the Philadelphia based Provident National Corporation, dates back to the mid-19th century. In 1982, Pittsburgh National Corporation and Provident National Corporation merged into a new entity named PNC Financial Corporation. It was the largest bank merger in American history at the time. Between 1991 and 1996, PNC purchased more than ten smaller banks and financial institutions that broadened its market base from Kentucky to the Greater New York metropolitan area. In 2005, PNC acquired Washington, D.C. based Riggs Bank. PNC completed the acquisition of Maryland-based Mercantile Bankshares on March 2, 2007. On June 7, 2007, PNC announced the acquisition of Yardville National Bancorp, a small commercial bank centered in central New Jersey and eastern Pennsylvania. The transaction was completed in March 2008. On July 19, 2007, PNC announced the acquisition of Sterling Financial Corporation, a commercial and consumer bank with accounts and branches in central Pennsylvania, northeastern Maryland and Delaware. The transaction was also completed in 2008. For more details on this topic, see National City acquisition by PNC. 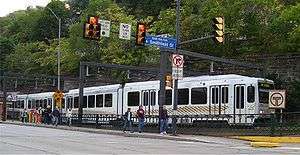 In an October 9, 2008 article in the Wall Street Journal, PNC was cited by unnamed sources as one of the leading contenders to acquire Cleveland based National City Bank. On October 24, 2008, PNC announced that it would acquire National City Corp. for US$5.2 billion in PNC Stock. 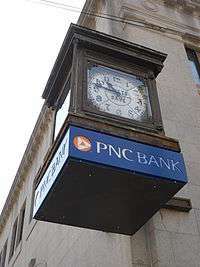 The acquisition, which helped PNC double in size and to become the sixth largest bank in the United States by deposit and fifth largest by branches, came hours after PNC sold 15% of its stake to the United States Treasury as part of the $700 billion bailout plan, which it repurchased within two years. The deal was approved by shareholders of both banks on December 23, 2008, and completed on December 31, 2008. 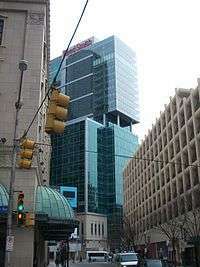 The deal made PNC the largest bank in Pennsylvania, Ohio, and Kentucky, as well as the second largest bank in Maryland and Indiana. It also greatly expanded PNC's presence in the Midwest as well as entering the Florida market. National City complemented PNC's presence, as Western Pennsylvania, Cincinnati, Ohio and Louisville, Kentucky were among the few markets before the acquisition deal in which both banks had a major presence. 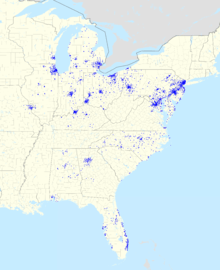 PNC completed the conversion of the National City branches on June 14, 2010, having its footprint stretch from New York City to St. Louis, with branches as far south as Miami and as far north as Sault Ste. Marie, Michigan on the Upper Peninsula of Michigan. In December, 2013, the Department of Justice and the Consumer Financial Protection Bureau announced that they had reached an agreement with National City Bank to resolve allegations that the bank had charged Black and Hispanic borrowers higher prices for mortgages. In the complaint, regulators claimed that National City had violated the FHA and ECOA by charging more than 75,000 borrowers higher loan rates based on their race or ethnicity rather than their risk level. National City’s lack of pricing guidelines resulted in black borrowers being charged an average of $159 more in extra upfront fees or higher interest than white borrowers. Black borrowers also paid an average of $228 more annually over the life of the loan than white borrowers. Hispanics paid $125 more upfront and $154 more annually than white borrowers. Under the terms of the settlement, PNC was required to pay victims $35 million. A report in the December 15, 2010 issue of the American City Business Journals reported that PNC was looking to expand its Florida presence and that it was in talks to acquire Birmingham, Alabama-based Regions Financial Corporation, which would have greatly increased PNC's presence in the Southern United States. Since the December 15 report, the Dow Jones reported through the Wall Street Journal that Regions Financial was never in talks to be acquired by PNC. After PNC moved into Regions' home market of Birmingham through the RBC Bank deal in March 2012, rumors of a potential PNC-Regions deal down the road came up again. It was also reported that PNC had been in discussions with BankAtlantic, was finalized on January 31, 2011 when PNC bought BankAtlantic's Tampa Bay Area branches. The BankAtlantic deal, which did not include its South Florida branches where PNC already has a presence, closed in June 2011. On July 26, 2011, it was announced that PNC would acquire 27 branches in the northern Atlanta suburbs from Flagstar Bank. The deal was estimated to be worth about $42 million, and PNC assumed about $240 million in deposit accounts. The deal was complete as of December 2011. On June 19, 2011, PNC agreed to purchase RBC Bank from Royal Bank of Canada for $3.45 billion. With 426 branches total, RBC Bank had a significant presence in southern Virginia, North Carolina, South Carolina, Georgia, Alabama, and Florida. Of these regions, PNC had existing branches only in Florida which were rebranded when the National City merger occurred. Although announced over a month before the Flagstar Bank deal, the sale of RBC Bank did not close until March 2, 2012, three months after the Flagstar deal. BB&T, which later acquired the parts of BankAtlantic that PNC did not buy, was also in talks to acquire RBC Bank. PNC entered growing markets in the Southeastern US, such as Birmingham, Charlotte, Norfolk/Virginia Beach (Hampton Roads), Mobile, North Florida, Richmond, Greensboro/Winston-Salem (Piedmont Triad), and Raleigh/Durham (Research Triangle). At the same time, it expanded PNC's presence in South Florida, Tampa Bay Area to Orlando, and Atlanta. This acquisition filled a gap in PNC's market footprint between northern Virginia and central Florida, adding about 900,000 customers and 483 ATM locations. It made PNC the fifth-largest bank by branches behind Wells Fargo, Bank of America, Chase, and U.S. Bank and the sixth-largest by total assets behind the aforementioned four banks and Citibank. One PNC Plaza. 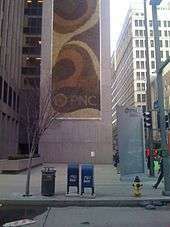 PNC's former corporate headquarters in Downtown Pittsburgh. 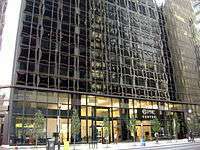 PNC is headquartered in a modern, 40 floor, 800,000-square-foot (74,000 m2) skyscraper it built from 2012–2015, located on the corner of Fifth Avenue and Wood Street in Downtown Pittsburgh. Officially opened on October 2, 2015, the building is named The Tower at PNC Plaza, in contradistinction to the previous headquarters building, known as One PNC Plaza, and located at 249 Fifth Avenue, catercorner to the new headquarters tower. The new building continues the company's continuous presence at this location since its earliest operations. On May 23, 2011, PNC unveiled plans for the $400M project, originally intended at 40 stories. PNC will owns the building and occupies all its space, except for street-level storefronts which are leased to retail tenants. The Tower is one of the world's most environmentally friendly skyscrapers. Some of its features include a double glass facade to reduce cooling costs and promote natural airflow into the building, a high-efficiency climate-control system to heat or cool specific zones of the building as needed, and a pair of living rooftops to collect and channel rainwater and reduce heat gain. Alternative energy sources, such as fuel cells, and solar and geothermal power, are being considered in an effort to reduce carbon emissions. PNC Bank branch, located in the historic National Bank of Washington building, in Washington, D.C.
PNC Bank NA is the principal subsidiary of the PNC Financial Services Group, Inc. Based in Pittsburgh, Pennsylvania, PNC Bank offers consumer and corporate services in over 2,500 branches in Alabama, Delaware, the District of Columbia, Florida, Georgia, Kentucky, Indiana, Illinois, Maryland, Michigan, Missouri, New Jersey, New York, North Carolina, Ohio, Pennsylvania, South Carolina, Virginia, West Virginia, & Wisconsin. PNC owns about 21% of publicly traded fund manager BlackRock. In June 2003, PNC Bank agreed to pay $115 million to settle federal securities fraud charges after one of its subsidiaries fraudulently transferred $762 million in bad loans and other venture capital investments to an AIG entity in order to conceal them from investors. PNC acquired the former United National Bancorp based in Bridgewater, New Jersey in 2004, and later announced that it would buy the Riggs National Bank which operated in the Washington, DC, area. Among other offenses, Riggs had aided Chilean dictator Augusto Pinochet in laundering money. PNC successfully completed the acquisition of Riggs in 2005 after the banks resolved a disagreement on the acquisition price. PNC Bank was forced to reissue hundreds of debit cards to customers in March 2006 when their account information was compromised. In the same month, PNC Bank was sued by Paul Bariteau, an investor in the Military Channel. Bariteau claimed PNC let the channel's chairman make unauthorized withdrawals of millions of dollars from the channel's account for personal use. The counter-claim was that Bariteau was only trying to recoup losses from a bad investment. PNC Bank branch, located in Georgetown, Washington, D.C. In April 2006, the J.D. Power Consumer Center released the results of its New York Retail Banking Satisfaction Study indicating that PNC Bank had an average number of satisfied customers. PNC has also subcontracted with Nationwide Bank and Washington Federal to process their home equity and auto loans. The operation sends out bulk mailings with offers and has customer care centers in Pittsburgh, PA and Kalamazoo, MI to handle this, and other PNC Bank customer service and sales calls. In the fall of 2006, PNC announced its purchase of Mercantile Bankshares, a Maryland bank with an extensive branch network throughout suburban D.C., Baltimore and northern Virginia. On September 17, 2007, PNC successfully completed the merger with Mercantile, making PNC the eighth largest bank in the United States by deposits. On September 15, 2007 PNC Bank acquired Citizens National Bank in Laurel, Maryland. PNC Bank branch and offices in Southgate, Michigan. On August 14, 2009, PNC took over Dwelling House Savings & Loan and its only location in Pittsburgh's Hill District after Dwelling House failed and was placed under receivership by the Federal Deposit Insurance Corporation. Although PNC was still in the process of integrating National City at the time, the bank agreed to assume all of Dwelling House's assets, and the branch became a PNC branch on August 17. Dwelling House had been known in Pittsburgh to provide low-income African Americans loans that other banks would deny, and had fended off receivership from the FDIC as recently as June 2009 through community fundraisers. PNC closed the former Dwelling House branch shortly after assuming Dwelling House's assets, with accounts transferred to the pre-existing PNC branch in the Hill District. The failure of Dwelling House is the only bank failure in Pennsylvania—a state otherwise relatively stable with banks—since the beginning of the financial crisis of 2007–2010, although two out-of-state banks with strong Pennsylvanian ties (National City and Wachovia) were reportedly close to failing at the time they were acquired by PNC and Wells Fargo, respectively. On July 30, 2012, PNC announced plans to put ATMs in 138 Harris Teeter grocery stores in the Carolinas. Virtual Wallet is a combination checking and savings account offered by PNC Bank. It was launched in July 2008 and was aimed primarily to the tech savvy members of Generation Y. According to PNC's press release it is a mobile application that features three integrated accounts: a checking account called Spend, a second, interest bearing checking account called Reserve and a savings account called Growth. The service had more than one million customers as of June 2012 and in December 2013 began allowing unlimited check payments. PNC Bank branch, located in the former headquarters of Riggs Bank on Pennsylvania Avenue, Washington, D.C. The corporation operates a leading community bank in its major markets and is a top-ten Small Business Administration lender. Operations include the third-largest bank automated teller machine network in the U.S. The corporation claims to operate environmentally friendly "green" bank branches and is a major wealth management firm. Following the merger of National City Bank in 2008, PNC now operates a credit card portfolio with most cards as Visa products with $5.6 billion in outstanding credit card loans. In 2014, they ranked as the 11th largest in Visa/MasterCard issuers and are looking to grow. In 1998, PNC sold its credit card business to Metris Companies and MBNA. In 2006, PNC got back into the credit card business by marketing and issuing credit cards, including one for small business, under the MasterCard brand by using a third-party vendor to handle its credit card business, partnering with Minneapolis-based U.S. Bank. After the National City merger in 2008, the U.S. Bank products were converted to full PNC Bank products. PNC Business Credit focuses on Asset Based Lending, providing capital to private equity groups and middle market companies. This division of PNC operates out of offices in the US, Canada and the UK, closing over 400 deals in the last 2 years (2011-2013) and more than $27 Billion in commitments under management companies. PNC’s goal is to get deals done in a short period of time. PNC operates a top-ten treasury management business and the U.S.'s second-largest lead arranger of asset-based loan syndications. Its subsidiary Harris Williams & Co. is one of the U.S.'s largest mergers and acquisitions advisory firms for middle-market companies. PNC Mortgage (formerly National City Mortgage) is the mortgage division of PNC. Acquired through the National City deal, PNC Mortgage is credited with the first mortgage in the United States, and has offices across the country. This is the second mortgage division to be named PNC Mortgage. PNC had sold off the original PNC Mortgage to Washington Mutual in 2001 due to volatility in the market despite the fact that the market was in a "boom" period at the time, then subsequently outsourcing mortgages to Wells Fargo until the National City deal. PNC has no plans to enter the subprime lending market that plagued National City Mortgage. The corporation's Global Investment Servicing subsidiary was the second-largest full-service mutual fund transfer agent in the U.S and the second-largest full service accounting & administration provider to U.S. mutual funds. PNC Global Investment Servicing had provided services to the global investment industry since 1973. With 4,700 employees, PNC Global Investment Servicing operates from Ireland, the United States and the Cayman Islands, PNC International Bank Limited operates from Luxembourg. PNC Global Investment Servicing services $1.9 trillion in total assets and 58 million shareholder accounts. In 2007 PNC Global Investment Servicing Trustee & Custodial Services Limited was awarded a banking licence by financial regulators allowing it to expand further into Europe. As a result, the name changed to PNC Global Investment Servicing. PNC Global Investment Servicing was formally known as PFPC until July 2008. On February 2, 2010, longtime crosstown rival The Bank of New York Mellon announced a definitive agreement to acquire PNC’s Global Investment Servicing. PNC sold it off in order to pay back its TARP funds, which were used to buy National City Corp., which PNC at the time was still in the process of converting branches over to PNC. BNY Mellon closed the purchase of PNC Global Investment Servicing on July 1, 2010. PNC has an equity stake of around 21.7% in BlackRock, the world's largest publicly traded asset management firm by AUM. PNC provides acquisition, development and permanent financing for commercial and multifamily real estate clients including a new term loan program and treasury management and capital markets services. Target clients include commercial real estate owners, operators, developers, and investors nationwide. Property types include office, multifamily, affordable housing, industrial, retail, seniors housing, healthcare, self-storage and lodging. In the May 2012 edition of National Real Estate Investor (NREI) magazine, PNC Real Estate ranked number 2 in the top 25 biggest direct lenders. The rankings are based on responses to NREI's 21st annual Top Lenders Survey and reflect total dollars financed or arranged in commercial real estate during the 2011 calendar year ($11.01 billion). PNC Real Estate also ranked number 6 in the top 25 biggest financial intermediaries category ($4.77 billion). Midland Loan Services, a division of PNC Real Estate, is a third-party provider of service and technology for the commercial real estate finance industry. It specializes in commercial loan and CMBS portfolio servicing. Founded in 1991, its headquarters are in Overland Park, Kansas. In December 2011, Mortgage Bankers Association (MBA) Commercial Real Estate/Multifamily Finance ranked Midland Loan Services number 2 in the top 100 largest commercial/multifamily loan servicer category ($355.1 billion) for year-end 2011. The corporation has sponsored a number of initiatives to improve education, health and human services, and cultural and arts activities. These include a "PNC Grow Up Great" commitment to early childhood development, the "PNC Foundation", and community development investments. Since 1984, PNC Financial Services has compiled the Christmas Price Index, a humorous economic indicator which estimates the prices of the items found in the song "The Twelve Days of Christmas". In 2012, PNC opened the PNC Fairfax Connection, a next generation community center in Cleveland, OH. Outside a branch in Freeport, Pennsylvania. Wikimedia Commons has media related to PNC Financial Services. 1 2 3 4 "2011 Form 10-K, PNC Financial Services Group, Inc.". United States Securities and Exchange Commission. ↑ "Click More Search Options, under Size or Performance choose Total Deposits and under Equal or Greater than enter $100,000,000,000. (It's necessary to perform the search manually on each occasion due to the website's configuration)". Fdic.gov. Retrieved April 16, 2012. 1 2 "PNC To Acquire RBC's United States Unit « CBS Pittsburgh". Pittsburgh.cbslocal.com. 2011-06-20. Retrieved 2015-03-09. ↑ "PNC Bank Profile Information". Rate Rush. Maugans Corp. 2010. Archived from the original on 2010-07-29. Retrieved 2010-06-13. ↑ Thurston, George H. (1888). Allegheny county's hundred years. Pittsburgh: University of Pittsburgh, Digital Research Library. p. 258. 1 2 White, Edward (1903). A century of banking in Pittsburgh. Pittsburgh, Pa: University of Pittsburgh, Digital Research Library. p. 19. 1 2 3 4 5 6 7 8 "Corporate History". PNC Financial Services Group, Inc. 2010. Retrieved 2010-06-12. ↑ Archived October 25, 2008, at the Wayback Machine. ↑ Archived November 9, 2009, at the Wayback Machine. ↑ "PNC to Acquire National City" (Press release). PNC Financial Services Group, Inc. 2008-10-24. Archived from the original on 2010-11-04. Retrieved 2010-06-12. ↑ "CFPB and DOJ Take Action Against National City Bank for Discriminatory Mortgage Pricing". Consumer Financial Protection Bureau. Consumer Financial Protection Bureau. Retrieved 9 June 2016. 1 2 Bandell, Brian (December 16, 2010). "PNC looking at Regions, BankAtlantic". ↑ "2nd UPDATE: PNC Not In Discussions To Buy Regions -Sources". The Wall Street Journal. December 15, 2010. ↑ "PNC Bank buys RBC branches in Birmingham area | AL.com". Blog.al.com. Retrieved 2015-03-09. ↑ "PNC to buy Florida banks | TribLIVE". Pittsburghlive.com. 2011-01-31. Retrieved 2015-03-09. ↑ "PNC to buy Atlanta Flagstar Bank branches". Atlanta Journal-Constitution. June 26, 2011. 1 2 "Reuters: PNC to buy RBC unit for $3.45 billion". Pittsburgh Tribune-Review. June 19, 2011. ↑ Belko, Mark. "PNC shows off tower, its crown jewel". Pittsburgh Post-Gazette. Retrieved 2015-10-02. 1 2 "Pnc Announces Plans For World'S Greenest Skyscraper". Multivu.prnewswire.com. 2011-05-23. Retrieved 2015-03-09. ↑ "The Tower at PNC Plaza". Pncsites.com. Retrieved 2015-03-09. ↑ "Annual Report 2009". PNC Financial Services Group. 2010-03-11. Retrieved 2010-06-12. ↑ "Cincinnati Enquirer". Retrieved 2006-09-17. ↑ O'Hara, Terence (February 11, 2005). "Washington Post". The Washington Post. Retrieved 2006-10-27. ↑ "USA Today". Usatoday.com. March 16, 2006. Retrieved 2006-09-17. ↑ Archived April 19, 2006, at the Wayback Machine. ↑ Fitzpatrick, Dan (2006-10-10). "PNC buying Maryland bank in $6 billion deal". Pittsburgh Post-Gazette. Retrieved 2015-03-09. ↑ "Institution History for LAUREL MAIN STREET BRANCH (229427)". Federal Financial Institutions Examination Council. Retrieved 19 February 2013. ↑ Boselovic, Len (August 14, 2009). "PNC to take over troubled Dwelling House". Pittsburgh Post-Gazette. ↑ Grant, Tim (August 18, 2009). "Dwelling House accounts moved to PNC". Pittsburgh Post-Gazette. ↑ DRR. "FDIC: Failed Bank List". Fdic.gov. Retrieved 2015-03-09. ↑ "PNC Bank to add ATMs at Harris Teeter stores". News & Record. July 30, 2012. Retrieved July 31, 2012. ↑ "Compare Insurance - Guaranteed Discounts & Cash Back with I'm Insured". Finance-weblog.com. 2013-10-13. Archived from the original on 2013-05-25. Retrieved 2015-03-09. 1 2 "CashEdge, Account Aggregation | Fiserv". Cashedge.com. Retrieved 2015-03-09. ↑ "PNC's Virtual Wallet tops 1 million - Pittsburgh Business Times". Bizjournals.com. 2012-06-12. Retrieved 2015-03-09. ↑ "Online Banking & Money Management - Virtual Wallet by PNC". Pncvirtualwallet.com. 2013-05-13. Retrieved 2015-03-09. ↑ "Behance". Behance. Retrieved 2015-03-09. ↑ "Company news; mbna is buying pnc bank's credit card operations". The New York Times: Business Day. December 24, 1998. Retrieved 2010-12-07. The MBNA Corporation, the nation's third-largest credit card lender, said yesterday that it would buy the credit card operations of the PNC Bank Corporation, which is exiting the business. MBNA will pay $443 million, a 15 percent premium, for PNC's $2.9 billion in credit card receivables. 1 2 Patricia Sabatini (August 29, 2006). "PNC tries new credit cards, old strategy". Pittsburgh Post-Gazette. Retrieved 2010-12-07. Starting Friday, PNC will market and issue credit cards -- including one for small businesses under the MasterCard brand -- in partnership with Minneapolis-based U.S. Bank, w... Mr. Tucillo said using U.S. Bank, a leader in the field, will help PNC control costs. ↑ Bill Toland (December 21, 2008). "PNC races to wrap up National City takeover". Pittsburgh Post-Gazette. Retrieved 2010-12-07. PNC sold its mortgage-origination business to Washington Mutual in 2002, and likewise uses a third-party vendor to issue credit cards. ↑ Archived April 13, 2008, at the Wayback Machine. ↑ "PNC Bank and Wells Fargo Home Mortgage Form Joint Venture To Make Homeownership Easier" (Press release). PNC Financial Services Group, Inc. 2005-09-14. Archived from the original on 2011-07-14. Retrieved 2010-06-12. ↑ Fitzpatrick, Dan (September 12, 2007). "CEO says PNC 'not a player' in subprime loan fallout". Pittsburgh Post-Gazette. ↑ "BNY Mellon to Acquire PNC's Global Investment Servicing" (PDF). Bnymellon.com. Retrieved 2015-03-09. ↑ "About Us". BlackRock, Inc. Retrieved 2011-06-18. ↑ "About PNC Grow Up Great". PNC Financial Services Group, Inc. 2010. Retrieved 2010-06-12. ↑ "PNC Fairfax". Pncfairfaxconnection.com. Retrieved 2015-03-09. ↑ Hicks, Vanessa (2010-07-28). "PNC Bank Moves to Capital Plaza One in Orlando - CoStar Group". Costar.com. Retrieved 2015-03-09. ↑ Marcinek, Laura (February 15, 2013). "PNC Names Demchak to Succeed Rohr as Bank's CEO". Bloomberg. ↑ "Merle E. Gilliand, 76, Chairman Who Led Growth of PNC Bank". The New York Times. December 11, 1998.